This article was originally published in the Rails to Trails magazine. It has been posted here in an edited format. 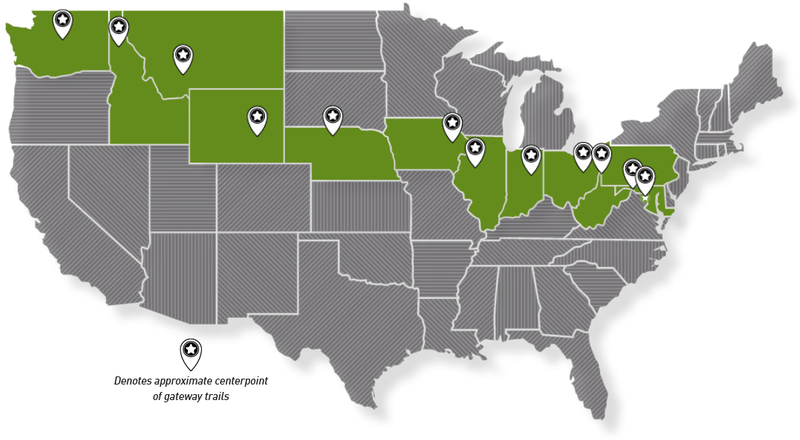 Imagine what’s possible with a trail that connects the country. Imagine ... pedaling across the entire country on a safe, seamless and scenic pathway—or walking a local trail that connects along historic routes. That vision will become a reality thanks to the Great American Rail-Trail, a signature project of Rails-to-Trails Conservancy (RTC) and the organization’s most ambitious TrailNation™ project yet. The possibility of a coast-to-coast rail-trail has been known for decades as RTC tracked rail- trails being developed east to west along the same course charted by the railroad a century ago. RTC’s late co-founder David Burwell once hoped that “one day, you could go across this entire country … on flat, wide, off-road paths. I want rail-trails to be ‘America’s Main Street.’” Now, that dream—and the potential of the Great American Rail-Trail—is ready to be realized.